It was kind of ironic that on the day I half-joked about drinking as motivation for exercise, I would come across these two examples of just how close the world is to ending…. At the Nobler Experiment, I’ve talked quite a bit about infusion, extraction, and some overall concept of “flavoring”. The intention of course being, to add fresh and interesting ingredients to your liquor loving experiences. For the fruit infusions, there is a little additional motivation, in that the fruit “flavored” alcohols on the market are almost all disgusting. I find Absolut Citron to be one of the few exceptions here, and while I am sure there are more, the smell and taste of these flavored boozes makes me nauseous. And those are the fruit based liquors! Who the hell was asking for glazed donut and buttered popcorn?!!!! The liquor store owner sort of laughed when he saw me snapping a picture. And maybe that’s part of why he chose to sell it. Maybe there are enough people who would quickly make their way from awe to intrigue but I can’t believe that. Not if I want to think we have a chance as a species. Okay, that’s a little dramatic. So tell me, anyone willing to try this stuff and let us know if it’s as disgusting as it sounds? 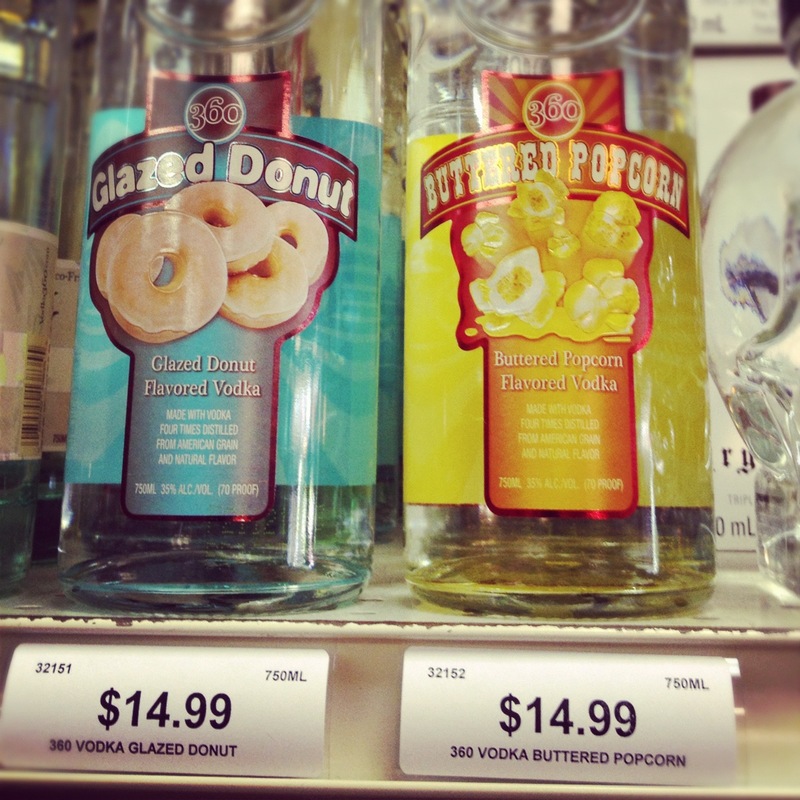 Anyone out there want to admit to loving these and other ridiculous flavored alcohols…whipped cream? bubble gum? I’m guilty, I like whipped cream vodka. 😮 ! But I have a serious sweet tooth. I’ll let it slide! Just can’t promise the wedding cocktail will use that stuff :).